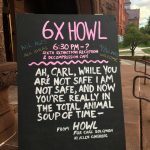 Rachel Jones at Seven Days has written a nice piece on the 6X Howl organized by BASTA! in connection with Sixth Extinction author Elizabeth Kolbert’s visit to the University of Vermont. Kolbert’s book is this year’s “First Year Read,” which all incoming UVM students are expected to be reading and discussing.